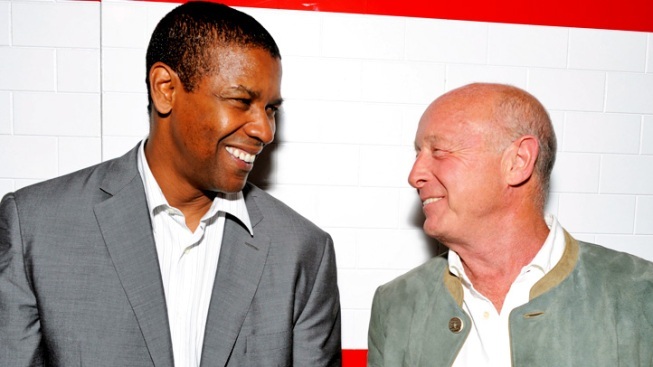 Director Tony Scott, who frequently worked with Denzel Washington, died after jumping off a bridge in Los Angeles. Coroner's officials say it will be a month or more before they determine an official cause of death for "Top Gun" director Tony Scott. The office is treating the 68-year-old's death as a probable suicide, but spokesman Craig Harvey says doctors must review toxicology tests and tissue samples. Scott died after leaping from the Vincent Thomas Bridge into the Los Angeles Harbor on Sunday afternoon. The director of action flicks such as "Beverly Hills Cop II" and "Days of Thunder" left behind notes to loved ones in his car and another location. An autopsy was performed on the British-born director's body Monday. It is typical for autopsy results to take a month to six weeks or longer to allow for additional testing. Several people called 911 around 12:35 p.m. Sunday to report that someone had jumped from the Vincent Thomas Bridge spanning San Pedro and Terminal Island in Los Angeles Harbor, according to Los Angeles police Lt. Tim Nordquist. A dive team with Los Angeles Port Police pulled the body from the murky water several hours later, Nordquist said. Scott's body was taken to a dock in Wilmington and turned over to the county coroner's office. One lane of the eastbound side of the bridge was closed to traffic during the investigation. Cargo vessels moved at reduced speeds through the east side of the port's main channel during the search, said Los Angeles Fire Department spokesman Brian Humphrey. Investigators found a note in Scott's black Toyota Prius, which was parked on the bridge, according to the Los Angeles Times. That note listed contact information. A suicide note was later found at his office. The British-born Scott, who lived in Beverly Hills, was producer and director Ridley Scott's younger brother. Distinct visual styles mark both siblings' films — Ridley Scott mastering the creation of entire worlds with such films as "Gladiator," ''Blade Runner," ''Alien" and this year's "Prometheus," Tony Scott known for hyper-kinetic action and editing on such films as his most recent, the runaway train thriller "Unstoppable," starring regular collaborator Denzel Washington. Some of Hollywood's big names took to Twitter Monday to mourn the loss of Scott — and of any future movies from him. Scott was a thrill-seeker himself in his personal life, an avid rock climber who also liked driving fast cars and motorcycles. Still, filmmaking was his real thrill. "The biggest edge I live on is directing. That's the most scary, dangerous thing you can do in your life," Scott said in an interview for his 1995 naval adventure "Crimson Tide." ''The scariest thing in my life is the first morning of production on all my movies. It's the fear of failing, the loss of face and a sense of guilt that everybody puts their faith in you and not coming through." Tony was the first of the Scott brothers to enjoy blockbuster success with "Top Gun," starring Tom Cruise, the top-grossing film of 1986 at $176 million. Scott teamed with Cruise again four years later on the hit "Days of Thunder." He also had a sequel to "Top Gun" in development. But Ridley Scott later managed more and bigger hits than his brother and earned a level of critical respect never achieved by Tony Scott. "Gladiator" won the best-picture Academy Award for 2000 and earned Ridley Scott one of his three best-director nominations; Tony Scott never was in the running for an Oscar, and critics often slammed his movies for emphasizing style over substance. Even Scott admitted that it was a challenge to infuse drama into some of his scenarios — for example, cars racing in circles in "Days of Thunder." In an interview for that 1990 summer hit, Scott was blunt about where some of the ideas came from. "I'm always pushing for something new and fresh in the way things are shot, and the rest happens in the editing room. ... The real speed comes from the cutters and what they do with the celluloid." While Ridley Scott had an auspicious start to his film career with 1977's acclaimed period drama "The Duellists" and 1979's "Alien," Tony Scott bombed with his debut, 1983's supernatural romance "The Hunger," with David Bowie and Catherine Deneuve. He vaulted into Hollywood's top ranks the next time out, with "Top Gun," followed a year later by "Beverly Hills Cop II," both with producer Jerry Bruckheimer. The two brothers ran Scott Free Productions and were working jointly on a film called "Killing Lincoln," based on the best seller by Bill O'Reilly. Along with countless commercials, their company produced the CBS dramas "NUMB3RS" and "The Good Wife" as well as a 2011 documentary about the Battle of Gettysburg for the History Channel. Tony Scott said he gained perspective by mixing things up between film, TV and commercials. "I like changing the pace of my life, changing my discipline. It gives me ideas for how to see the world differently," Scott said in a 2007. Besides "Unstoppable," Scott worked with Washington on four other movies: "Crimson Tide," ''Man on Fire," Deja Vu" and "The Taking of Pelham 123." In a tweet Sunday, director Ron Howard said, "No more Tony Scott movies. Tragic day." Other Scott films include "True Romance," written by Quentin Tarantino, "The Fan," with Robert De Niro, and "Enemy of the State," starring Will Smith. Scott was married to actress Donna Scott, who appeared in several of her husband's films. They have twin sons. Completed in 1963, the 6,060-foot Vincent Thomas Bridge links rises 185 feet at its highest point above the Los Angeles Harbor. Many have taken their lives by jumping from the span. The bridge has been used in many Hollywood productions, among them "Charlie's Angels" And "The Fast and the Furious."